As I have mentioned previously, I moved last summer. Part of my retirement planning included a smaller place that would be easier to take care of. 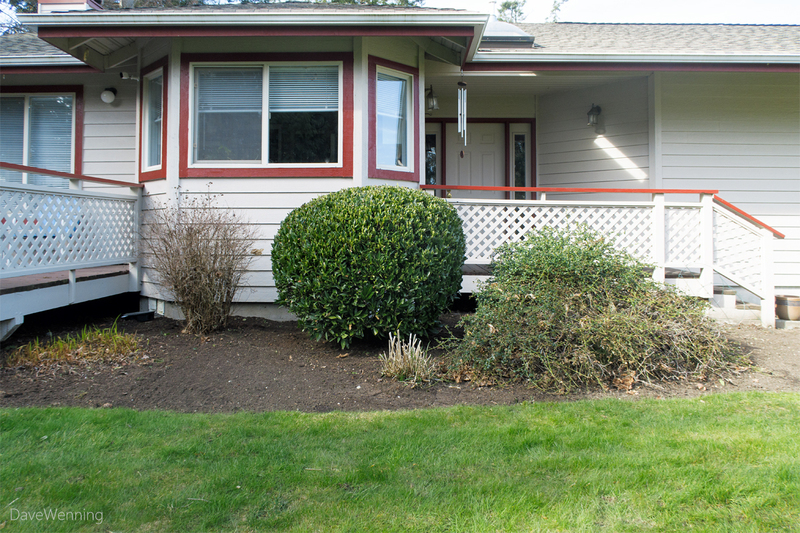 I found this townhouse in a planned community which was almost perfect for my needs. I say almost perfect, because for an avid gardener, the plantings around this house were a bit of a disaster. For starters, a small street-side bed (above) included a pair of overgrown rhododendrons that completely blocked the window. My office is in that room, and it was frustrating to work at the computer and not be able to see out. I don't know much about the history of the house or who lived here before. I think it was vacant for a while before I moved in. It may also have been a rental for a time. The entry garden was in very sad shape. A potentilla shrub (left) had died before I moved in. They require regular watering, but it got none during last summer's drought. On the right is a California Lilac, probably Ceanothus 'Victoria.' Now, that's a beautiful, drought-tolerant shrub that wants to be 10-12 feet high and wide. That is much too big for the spot. It apparently does not tolerate severe pruning either. Instead of a stately, upright shrub, the poor thing had become a tangle of horizontal criss-crossing branches. One side of it was partly dead. The only humane thing to do was put it out of its misery. In the mid foreground, the stubble marks the grave of a dead hydrangea. This is another beautiful shrub that requires regular watering. It also likes a bit of shade but doesn't get much in that spot. 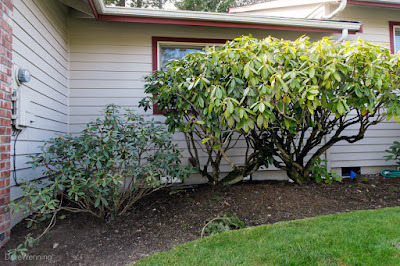 Finally, the only healthy plant in the bed, was the pruned laurel, I'm guessing, 'Otto Luyken" or something similar. They are nice as a low hedge or part of a mass planting, but they're boring as a specimen plant. This one was a globe covered in sliced up leaves. It had to go. Finally, the deck garden was an example of what I call "Safeway parking lot landscaping." It was a narrow bed with tidy bushes all in a row. 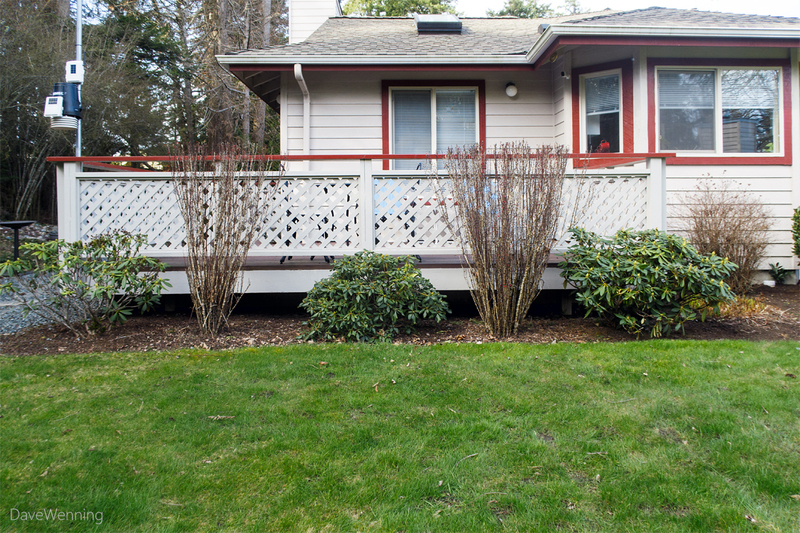 The taller vase-shaped shrubs are Japanese Barberry (Berberis thungergii). As you can see, they are quite unattractive through the winter. Also the way they were pruned was bugging me. I decided to keep the rhododendrons and rearrange them a bit, but the Barberries had to go. 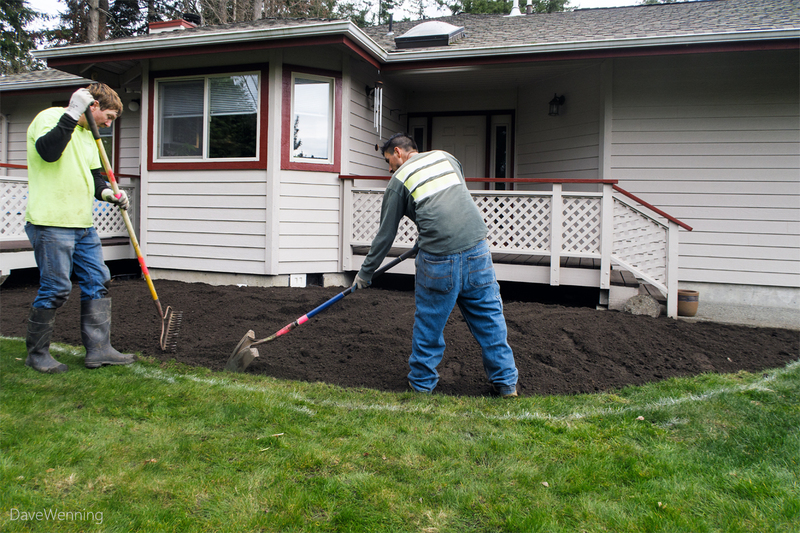 On day one, the first priority was removing those overgrown rhododendrons from the street-side bed. We left the smaller rhody on the left, but it will need some TLC to get it into shape. I had some concrete pavers I brought from the other house and we arranged them Asian style. 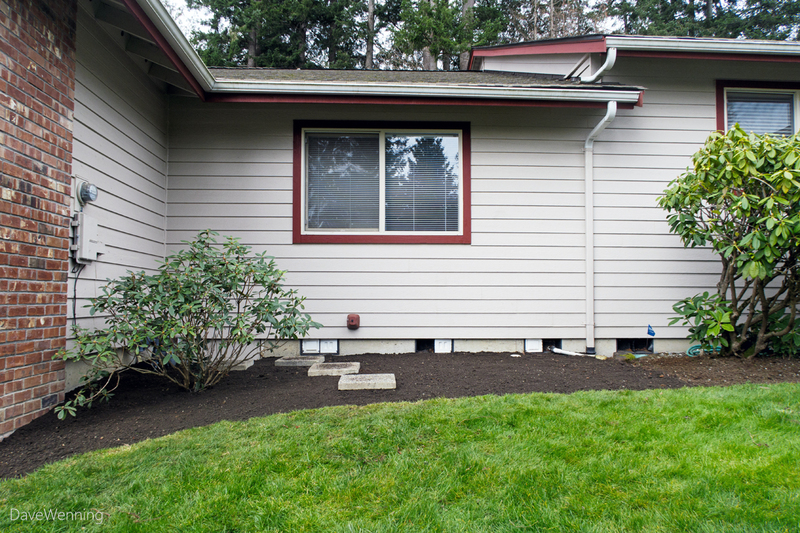 They provide access to the crawl space opening, and to where a garden hose will be stored. 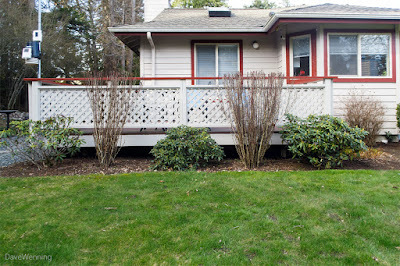 Both the entry and deck gardens had straight, angular borders. After removing almost all of the old plantings, we widened the beds slightly and gave them curvy, undulating borders for a more organic look. The lawn mowing service comes with large stand-on mowers, so we had to make sure they could negotiate the borders. During rainy periods, water tended to form a large puddle by the steps. We extended the bed downhill along the walk which should allow rain water to drain from the bed more readily. The landscaper brought some additional topsoil to raise the beds slightly which should also help. 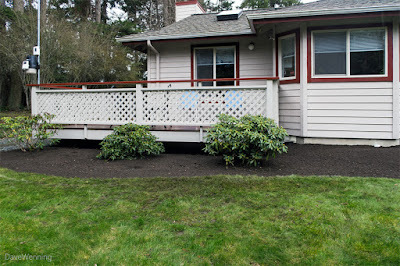 The only remaining plants from these side beds were the three rhododendrons along the deck. I plan to move the one on the right over between the other two to form a grouping. The left-most rhody will get some much needed TLC. I don't know what varieties these are. I'm hoping I might be able to figure it out when they bloom. We also found a sprinkler head in this section which was buried half a foot underground. Rhododendrons are not usually thought of as drought-tolerant shrubs. If you give them a year or two of careful watering, however, they will easily tolerate our cool, rain-free summers. After all, while other shrubs in this garden died, the rhododendrons thrived. Note that the Washington state flower is our native Pacific Rhododendron. They thrive in the woods with no care at all. Because of our climate, western Washington is known as a world center of rhododendron culture. I have been gardening for more then 65 years. From an early age, my childhood was spent working in the garden with my grandmother. Her dahlias were something to behold. I caught the bug early, and I have never been without a nice garden, even at places I rented. Needless to say, it was important for me to get the gardens at this house into shape and presentable.